Tiara crystal dogwood flower basket. 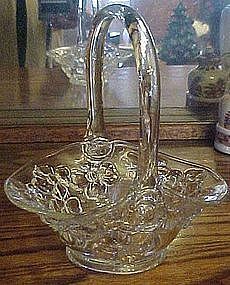 Pretty and dainty clear crystal basket with the dogwood flower's pattern. Tiara line by Indiana glass. They used molds from other popular glass manufacturers such as as Fenton, Duncan Miller ect. Basket measures 7 1/4" tall. Basket makers mark onthe handle is DB. Excellent condition with no damages.